﻿Total Loss Replacement Services | Switchbox, Inc.
TLRS was a startup company backed by a powerful need at a national car insurance company. 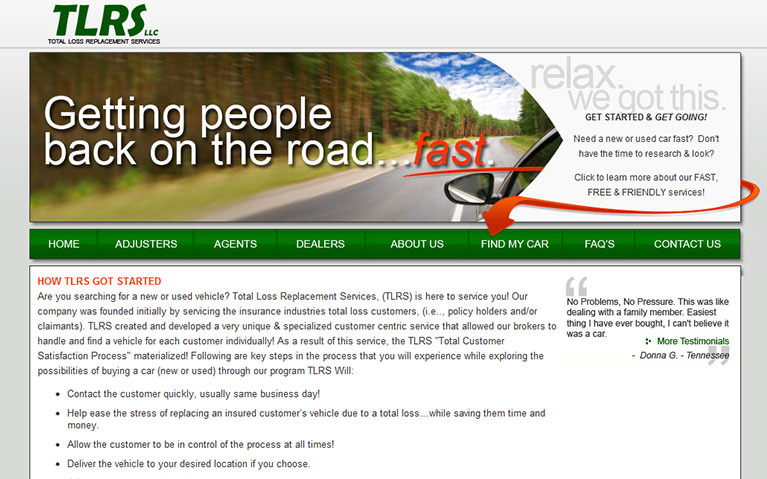 After an extensive survey of why customers left their car insurance provider a large issue was uncovered. Customers are most likely to leave their existing carrier after their car is in an accident resulting in a total loss (aka totaled). Customers tend to be frustrated with the final payout amount their car insurance provide gives them after the loss and so a solution was needed to keep costs low for the insurance company while providing customers with the feeling that the payout was fair. TLRS was only allowed to take on the project if they could guarantee the following… TLRS had to make a recommendation for a similar year, make, model, color, and mileage within 24 hours of the insurance company reporting the total loss. They had to do this by contacting the customer within 4 business hours, asking a series of questions, and relaying the information to a series of used car dealers within a multistate region. After receiving responses from the dealers they had to provide options to the insured driver and if the driver accepted one of the options TLRS had to deliver the car within another 2 business days to either their home or office. In order to get credit for the successful completion TLRS had to maintain an audit trail of communication, provide an online interface for staff at the insurance company, and get the customer to fill out a satisfaction survey. TLRS started with a paper based system, a phone, and a spreadsheet. The solution worked okay when 1 or 2 requests came in per day but after the limited pilot program increased everything fell apart. TLRS staff where not able to keep track of all the different requests in different stages of the process (new request, need to contact customer, dealers submitting pricing, waiting on customer decision, etc.). Customers were starting to complain and staff at the insurance company were starting to recommend the program be stopped. Switchbox was brought in at the early stages of the project encountering scaling issues and worked closely with TLRS and the insurance company to reach a solution. As with all business automation issues, Switchbox started by understanding the current process. We discovered a number of points in the process where phone calls were made simply to get approval to move forward. To optimize this we built a dashboard for all staff members that immediately showed them what approvals were waiting on them. Phone calls and emails were immediately stopped and it took seconds to get approvals that normally took a full day. Next we identified communication with the car dealers as a major hurdle. Dealers were forced to print emails with specifications on each car that was needed, and then manually respond with options. We provided an automated email reminder system that allowed dealers to track what requests were pending and in what stage. As cars were found they were able to upload options for the agents and customers to view and approve. The final solution allowed insurance agents to enter a customer’s info and then essentially ignore the request until the cars were lined up. If the customer chose a car a single button started the process for the insurance company to send the check to the car dealer and the car arrived at the customers home or business a day or two later. Prior to our system being in place about 150 referrals where handled manually each month. After the system was launch the new automated system handled over 1,100 referrals a month with no increase in staff. That allowed for over a 700% increase in business without adding any staffing costs. Since variety of used cars was critical to the success of the project we also focused on getting more dealers involved. The amount of communication from the original 3 dealers was difficult for a single person to handle however after our system launched 180 dealers from around the country were able to provide options for each bid. That task would have been impossible without an automated system in place. Lastly, our client was able to take the software and sign two additional insurance companies on to increase their business. When asked what allowed them to convince these new national companies to sign our client shared that the reporting engine allowed them to prove an effective ROI for the software. Or particular importance what the ability to prove that they had competitive bids within an average of 210 minutes, cars sold with an average of 2 days, and customers who used the TLRS system reported an increased retention rate of 45%.